Anderlecht played on a field in the Verheydenstraat until the World War. But the first real stadium was built in the Astridpark, where the current stadium is. Back then, the stages were in wood, but slowly everything was replaced by concrete constructions. In 1918, the was given a name: the Emile Versé stadium, after the first chairman of the club. 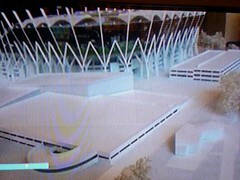 But the final construction was too small for the many European games of Anderlecht (see club history). That's why the club decided in 1983 to renovate the who stadium. This was the birth of the Constant Vanden Stock Stadium, that was built up in 5 phases.In 1983, tribune I (with 24 boxes (or lodges)) got finished. One year later, a corner (with 7 boxes) was placed next to it. In 1986 tribune III followed (with 600 business seats). Two years later it was the turn of tribune II, with another 400 business seats. Tribune IV was good for 8 boxes and 550 business seats. In a 5th phase the stadium got completely finished. This phase included the building of gigantic constructions, like the roof. To realise that, the firm Partek Ergon, used CAD system (Computer Aided Design). That way, it was possible to design quick plans and virtual projections of the stadium. Everything had to precise on millimeters! The most important thing was visibility. Eeach tribune consists out of 2 rings: the upper and the lower ring. In the lower ring of tribune 4, there are no seats. A second issue was security. That's why the number of seats was reduced to 28.000. Despite the fact that the UEFA dissuaded to build stands, the club did and prouved that stands are no risk for the security in a modern stadium. The number of police officers and stewards inside the stadium could be reduced because of the better security. The stadium exits are built in this kind of way that an evacuation can go fast.Another demand was the atmosphere inside the stadium. 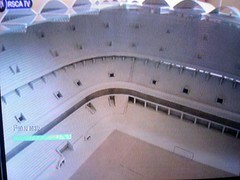 Therefore, the tribunes are built around the pitch without one opening. The disadvantage is that the wind can't reach the grass. This was solved by making a few passages in the tribunes. Parking places were provided under the tribunes. This posed special demands to the streinght of the whole construction, certainly because of the heavy roof. That's why the stadium was built in concrete. 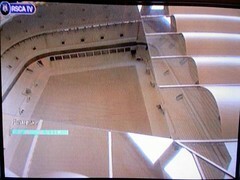 In 2001, Anderlecht's home was slightly adapted. The passages for the fans, the pitch and block M4 were improuved. Meanwhile, after long discussions about an enlargement, the final plans have finally been approved and construction will begin soon. This means that the Mauves will stay in the Constant Vanden Stock stadium for a while.